They’re Burning Down the House! President Donald Trump (R-NY) has done it again, he’s muddled history. On May 25, in a tetchy telephone conversation with Canadian Prime Minister Justin Trudeau, Trump unthinkingly said it was the Canadians, not the British who burned The White House in 1814. The British assault on Washington was in retaliation for an American attack on Ontario, then a British colony. The President referenced the War of 1812 when asked for what reason he claimed incoming Canadian steel and aluminum “a national security” issue. In the early 1800s the United States became inextricably involved in European affairs. Customs duties funded the federal government; British, French, and Spanish trading policies shaped local economies, and the ongoing commercial war between Great Britain and Napoleon’s France cost neutral American merchants unnecessarily. American merchants were little more than pawns. The North American continent was a showground of imperial competition. The British controlled Canada to the north, Spain controlled lands to the west and south. Both nations provided arms and encouragement to Native Americans, hoping to block American settlement beyond the Appalachian Mountains. Georgetown resident and Federalist newspaper publisher Alexander Hanson, of Baltimore, described the War of 1812 as “without funds, without an army, navy or adequate fortifications.” Who were the War Hawks and to what extent did Americans support a second war with Great Britain? The War Hawks were American politicians from southern and western states, western politicians like Henry Clay of Kentucky and Felix Grundy of Tennessee who favored war with Great Britain. Such a course was necessary to prevent British trade policies from further damaging the American economy. The War Hawks were opposed by New England merchants who feared that war would kill their Atlantic trade entirely. U.S. Representative John Randolph of Roanoke (DR-VA) opposed war with Great Britain. On May 29, 1812, he resolved that “under existing circumstances it [was] inexpedient to resort to war.” Randolph’s colleagues in the House disagreed. 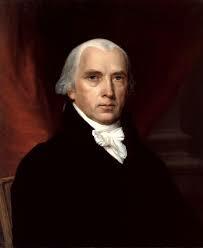 President James Madison (DR-VA) signed America’s declaration of war on June 18, 1812. The British attacked New York [Hudson River], New Orleans [Mississippi River], and the Chesapeake Bay [Potomac and Patuxent Rivers]. In 1812 the British blockaded the Bay, established a military base on Tangier Island, and ransacked waterfront towns. Eastern Virginia and Southern Maryland were under constant attack. Washington, D.C. was a dreary capital; Baltimore and Alexandria, D.C. trading titans. Historians have long criticized President Madison’s handling of the war, from the botched efforts to invade Canada to the burning of Washington. Why? Madison relied on Revolutionary War veterans whose martial skills had faded. Congress, in January 1814, increased the U.S. army from 11,000 to 62,773 men. Napoleon’s overthrow, his April exile to Elba permitted Britain’s war veterans to regroup, to ignore France and fight anew. On August 19, 1814, 4,000 British soldiers—including Maj. General Robert Ross—landed in Benedict, Maryland. The purpose: to raid Washington, also Alexandria, D.C., in retaliation for Toronto, Ontario’s 1813 capture. On August 24, 1814 “the British reached Bladensburg and the fight began,” Jennings continued. “That very morning General Armstrong (Secretary of War) assured Mrs. Madison there was no danger. The President, with General Armstrong, General Winder, Colonel Monroe (Secretary of State), Richard Rust (Attorney General), Mr. Graham, Tench Ringgold, and Mr. Duvall rode…to Bladensburg to see how things looked….” Commissary General of Prisoners John Mason, fourth son of George Mason IV, joined them. “All then was confusion,” Jennings recalled. “Mrs. Madison ordered her carriage, and passing through the [White House] dining room, caught up what silver she could crowd into her old-fashioned reticule, and then jumped into the chariot with Daniel Carroll [of Dumbarton House, then Belle Vue].” Gilbert Stuart’s portrait of George Washington was sent off on a wagon. The navy was America’s strength. Madison’s army however turned tail and ran. The President fled Washington, retreating first to Virginia and then the Brookeville, Maryland home of Quaker Postmaster Caleb Bentley. The First Lady departed separately, dwelling only two hours at Georgetown’s Dumbarton House. “Mrs. Madison slept that night at Mrs. Love’s [Virginia Rokeby Farm], two or three miles over the river,” Jennings concluded. “After leaving…she…went to Mrs. Minor’s a few miles further. 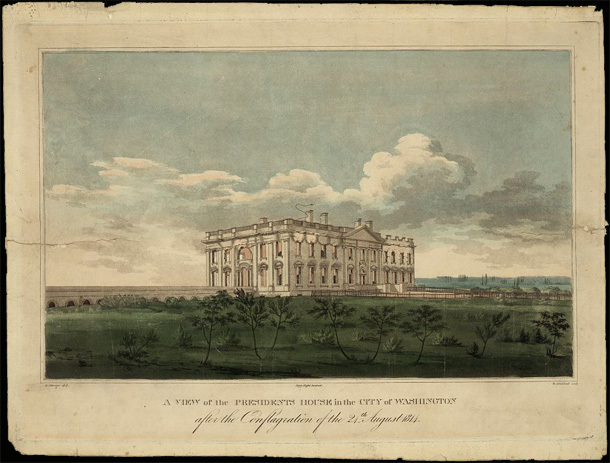 She, in a day or two, returned to Washington [and] found Mr. Madison.” The White House was in ruin and Alexandria, like Washington, remained defenseless. “In the evening of August 29, 1814, being on horseback, I stopped at General Armstrong’s lodgings [to talk] with him on the state of things in the District, then under apprehensions of an immediate visit from the [occupying] force at Alexandria,” President Madison wrote. “The previous attack on Washington had called away from Alexandria all the military men and military apparatus; so that when [Captain James Gordon’s] English squadron arrived before the town, there was nothing in the power of the remaining citizens but to meet them in the spirit of unresisting negociation,” Stabler concluded. “By this course, all irritation on both parts was prevented….” Alexandria Mayor Charles Simms’ summation was similar. Alternatively Fredericksburg’s John Minor, Brig. General of militia and former member of the Virginia House of Delegates, described Alexandria’s occupation as “a disgraceful disaster, a sad Tale.” When Minor saw “the Enemy going down the Potomac River with their plunder,” he called it “the Donations of Alexandria.” The British occupied Alexandria for five days, from August 28 until September 3. The British destroyed Washington; then returned to Benedict to again board their ships. Before leaving Benedict, British soldiers set Charles Smith’s Mount Arundel home on fire. Smith tried one last time to eliminate the enemy by offering the soldiers a poisonous whiskey brew. The Treaty of Ghent was signed on December 24, 1814. Scholars now study the War of 1812’s effect on culture and patriotism. Also analyze President Madison’s decision not to restrict civil liberties during wartime. With patience, America’s untried federal system survived. « Beauty Oils In the Summer? You Bet!